Different sorts of interruption that may occur during recording the videos can easily cause corruption or damage the video file completely. Sometimes the corruption is due to errors related to the memory card. While ejecting the memory card from a camera or camcorder during the transfer of the files or recording the video. Video files stored on the memory card can also get corrupted during usage of the memory card in various devices. The MOV, MP4 files can get damaged while transferring them between PC and camera/camcorder or any sort of error like power rise or sudden shutdown. They can also get damaged due to a faulty firmware that can make them inaccessible. Corruption may be caused during editing of the videos using various video editing tools. So, the question arises how to repair corrupted MP4 video files or any other file formats like MOV. To resolve this problem, Yodot MOV Repair software offers a great solution. It offers great repair features in order to fix damaged or broken MOV, M4V and MP4 video files. It guarantees a great and high success ratio for repairing video files in comparison with other MOV Repair tools. It smoothly repairs as well as fix all the MOV file that you have which got corrupted or damaged due to various reasons such as firmware error, file transfer error, memory card error, file system corruption etc. as mentioned earlier. It is considered to be best MOV repair application available. It repairs and fixes truncated as well as corrupted MOV video files. It also repairs HD or High Definition video files which are created by professional camcorder or camera. It provides a preview of repaired MOV, M4V and MP4 files before it restores them. It has a simple interface and has a completely automated repair process. It easily repairs file formats like MOV, M4V, and MP4 which are damaged and which doesn’t play in VLC, Apple Quick Time player or any other media players. It also repairs as well as fix truncated video files which are corrupted due to the faulty firmware of camcorder or camera. It even repairs large size MOV files without any effort and facing any issues. It smoothly repairs High Definition videos that are created by HD cameras. It has a simple interface, but it uses superior algorithms which extracts the video as well as audio frames of a MOV file, separately and then adjoins them finally to create a healthy MOV file which is playable. In case there is a data frame which is missing, this application skips those frames in order to complete the repair process. Once repair process has been done, one can preview the video file before saving it finally. It also offers a full preview of the repaired video files along with audio to allow you to make sure that the repair is done with 100% success. It supports the latest version of Windows and Mac OS X operating systems. It also supports repairing of video files which are created by various cameras and camcorders manufacturers such as Canon, Nikon, GoPro, Olympus, Contour etc. It supports different file formats such as MP4, M4V and MOV. This application offers a simple to use, and easy user interface and the users without any technical knowledge can operate it easily. The whole repairing process only takes 3-4 steps. It offers 24X7 free customer support provided at any time to help you out in case you have any issue. This software is also available to the users as a free demo version so that they can evaluate its performance before they decide to buy it. First, you need to download Yodot MOV Repair application to your Mac laptop or computer. 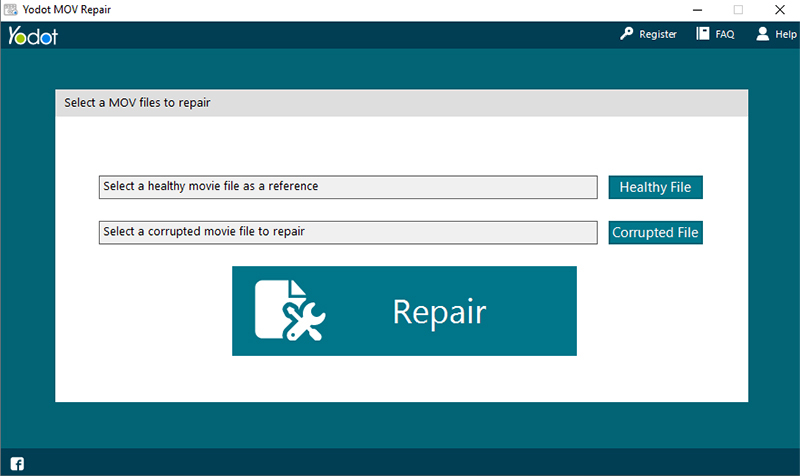 In case of Windows users, they need to download the Windows version of this tool to repair corrupt MOV video using their PC. Now Install and Run the application by simply following the guided steps shown on your screen in different windows. When the first window is opened, browse the desired MOV file and select it which needs to be repaired. In the first step, after selecting the corrupt video file in case of Windows users, they need to select a healthy, uncorrupted video file as a reference to fix as well as restore the repaired video file. The healthy video file that you have selected should be recorded using the same camcorder or camera as that of the corrupted video file. Now select “Repair” option. The software then starts scanning the process in order to repair the selected MOV file. Depending on the video file size, the application repairs the MOV video files within seconds and shows the result along with the description of the file. Now, preview the video file in order to confirm the success file repair. This software needs following system requirements. Hardware requirements- It requires Memory of 1 GB RAM and more. Free Disk Space of 50 MB for installation purpose. System type- 32-bit and 64-bit Windows OS and only 64-bit Mac OS. Supported File System- HFS+, HFSX, FAT and NTFS. Yodot MOV Repair software is a versatile video file repairing application which has simple and easy to use interface. It repairs the popular video file format such as MOV, MP4, M4V. It repairs all type of video files created by leading brands of cameras and camcorders. Its working is quite easy and provides repaired files within few seconds following simple and easy steps. It uses advanced algorithms and comes with the unique preview feature. It also offers free trial version and great customer support. All in all, it is a great software when it comes to repairing corrupted or damaged video files.